Principal’s List — Kamryn Apple, Haley Barnes, Wyatt Black, Riley Blair, Luke Bowsher, Gabriel Cathcart, Julia Couser, Vincent Crane, Evan Demmitt, Rhylee Eichhorn, Kaden Francis, Madison Garrett, Reese Gipe, Grayce Goodin, Owen Haak, Miriam Harmon, Seneca Harris, Violet Hazard, Lacie Henry, Brooke Hicks, Jacqueline Kadel, Kally Koble, Baylen Lair, Haley Lane, Simon Latimer, Adam Lawson, Sophia Mannier, Abigail Maxson, Connor Maxson, Kaitlyn McElroy, Coleton Moore, Anna Olivares, Katelyn Paulus, Wesley Penny, Karley Prosser, Hailey Register, Allison Rose, Tristan Rowley, Adam Schwartz, Brooke Shafer, Jackson Shane, Keara Stace, Allie Suber, Delanie Tennant, Karli Walker, John Weddle. 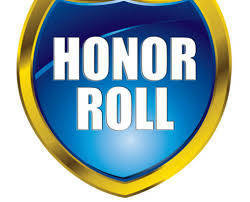 Honor roll — Halen Beck, Candice Bevan, Aaron Callahan, Adriana Carroll, Adrien Comer, Camden Comer, Macy Curtis, William Gillespie, Lorelei Gregory, Peyton Harper, Bryce Haught, Skyla Kerns, Peyton Massie, Aaron Mills, Braylon Rhoads, Austin Scherer, Addison Schmidt, Dalton Schreadley, Christopher Smith, Caleb Staley, Brianna Uhl, Logan Wells, Clark Wintrow, Kamden Wolfe. Principal’s list — Connor Apple, Cole Baxter, Drake Bennett, Maria Broerman, Andrew Crane, Kennedee Elifritz, Wesley Enis, Camryn Francis, Devin Goodpaster, Maryn Gross, Luke Hamaker, Fletcher Harris, Alaina Helsinger, Maria Hohenstein, Reagan Howell, Addison Jennings, Christian Johnson, Abigail Kadel, Cora Kinard, Vaughn King, Abigail Leiss, Jadyn Maingi, Madison Maxson, Lana McAdams, Elisabeth Norman, Hans Olson, Lindsey Ott, Logan Phillips, Jacob Riley, Jacob Roeth, Megan Rose, Evan Vallery, Emily Williams, Haylee Young. Honor roll — Devon Abshire, Maya Bowsher, Martin DesAutels, Ella Fine, Kaylen Gannon, Ayla Gilbert, Layton Hughes, Alexis Loughman, Noah Martin, Lucas Maxwell, Camren Monnin, William Moore, McKayah Musselman, Roy Musselman, Faith Overholser, Malea Padgitt, Gabrielle Paff, Karson Potts, Landin Putnam, Caleb Richter, Ty Roeth, Dakota Shields, Xander Smith, Emily Studebaker, Braeden Teale, Courtney Walker, Maelee Zerkle. Principal’s list — Lauren Barnes, Isaac Beal, Clark Bennett, Carter Bevan, Emma Bowman, Andrew Evans, Dottie Everett, Delaney Frock, Megan Gilliland, Rowan Gipe, Rachael Haak, Savanna Harris, Jewel Helton, Madeleine Latimer, Kinley Lavender, Isabelle Lewis, Megan McDowell, Colin McEldowney, Mason Moreland, Carly Olson, Delaney Osborne, Matthew Osting, Annika Paton, Ethan Paulus, Annabelle Penny, Megan Pohl, Adilyn Richter, Avery Roberts, Lindi Snodgrass, Talia Stace, Kendal Staley, Caleb Stone, Faith Thomas, Kierstin Thomas, Owen Van Horn, Emma Ward, Braden Zekas. Honor roll — Joshua Amheiser, Dylan Barnes, Connor Dalton, Ella Demmitt, Kylie Haught, Kylie Kinzer, Keira Kirby, Jessica Linn, Shelby Preston, Ryan Rowley, Sera Rush, Destiny Smith, Noah Swartz, Spencer Triplett, Emily Varady, Sarah Weaver, Dustin Winner, Charles Zawalich.